As you near race day, training requirements are ramping up and becoming more challenging to fit into everyday life. Whether you’re dealing with unseasonably high temperatures or schedule conflicts, we have answers. Learn how to power through the final weeks, finish strong and reach your running goals. Q: I am following a training program for the half marathon and I want to hit a specific time. I am having trouble hitting my pace times in hot weather. Any suggestions? A: The heat can definitely wreak havoc with your pacing if you have a goal time for your fall race. Generally, your training program should consist of mostly “conversation pace” running, with 1-2 runs per week that are for time. One of those runs should be a hill-repeat type of run; you should continue to run this outdoors and as fast as the heat allows. The real goal of hill running is to build strength and injury resistance, not to build speed. Your other, faster run is probably a tempo run or interval training. Try taking this run indoors in the summer. Inside, you will have a measured track (or if a track is not available, use a treadmill) and can easily make sure you are hitting your pace times. Also, you will avoid the heat and humidity indoors so you are more likely to hit your goal pace for these tempo and interval runs. Incorporating indoor speed work once a week will help you achieve the faster leg turnover and running economy you will need to hit your goal pace in your fall race. As the weather cools off and the humidity drops, your speed will come back. Most importantly, don’t push yourself in the heat to the point of heat exhaustion or worse. This very serious medical condition has long lasting effects on your health and running. 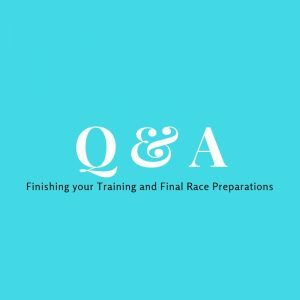 Q: I am training for a fall half marathon and I am two weeks behind on my training plan. I don’t want to give up on the race. What do I do? A: Assuming you are feeling healthy, you can start to “split the difference” to try to catch up. For example, let’s say your plan says that next week you are supposed to run a 10-mile long run and a 40-minute tempo run. But your longest runs so far was 6 miles, and you’ve only done a 20-minute tempo run a week or two ago. Next week, you can probably do a 9-mile long run and a 35-minute tempo run. That way, when the following week calls for a 12-mile long run and a 45-minute tempo run, you should be able to catch up. Listen to your body during this period of catch up. Catching up will create additional stress on your body and make you more susceptible to injury. If you feel extra sore or tired, consider skipping one or two of your short, conversation pace runs. These are not as critical to your race performance. Q: My final long run for the half marathon is coming up in a couple of weeks and I just realized we will be out of town that weekend. What should I do? A: Life often gets in the way of a runner’s training plan. Since your final run is probably 12 miles or so, you have a few options to consider. If you usually run on Sunday and you are leaving for the weekend on Saturday afternoon, try doing the long run early on Saturday morning. If your weekend plans are more involved, you can also consider doing the long run on Friday or Monday (before work if necessary). This time of year, it is light before 5:30 a.m. so you can probably get that long run in and still make it to work on time (or close to it). As a bonus, it is a lot cooler at 5:30 a.m. If none of those options works, but you have some lead time to plan, consider doing the long run the weekend before it is scheduled. That will probably cause you to have back-to-back weekends with long runs, but after that you will have a week longer taper period to recover. Remember your training plan is not cast in stone. Q: We are starting some home improvement projects at home and had planned to start the week before my fall half marathon. I have a goal time in mind that I really want to hit. Any advice? Q: My fall goal race is coming up in a few weeks and I think I am getting sick. I have a scratchy throat, watery eyes, runny nose. I’m afraid this will ruin my race. A: It is certainly possible to come down with a virus as your training peaks for fall racing. Hard training can negatively impact your immune system. If you have serious symptoms (i.e. fever, muscle aches, fatigue) definitely check with your doctor. If it’s just a scratchy throat, watery eyes, etc., you just may have fall seasonal allergies. It is ragweed season and this area is loaded with ragweed. Make sure you stay hydrated – mint tea with honey is one commonly used herbal remedy for allergies. Showering after you run (or go outdoors for other reasons) is very helpful to wash off the pollen. After you shower, stay indoors (in the air conditioning) to avoid exposure to pollen. Running in the evening will reduce your exposure to allergens as they tend to be higher in the morning and midday. Showering before bedtime is also helpful to reduce the pollen you breathe as you sleep. If your symptoms become very severe, work with your doctor if you feel you need medication to relieve the symptoms.